Visit I Buy Office Supply online at iBuyOfficeSupply.com which is a fast-growing online distributor of office products dedicated to quality products, competitive pricing, fast delivery and most importantly, the best in customer service. I Buy Office Supply's product selection includes over 300 top manufacturers including 3M, Global, GBC/Quartet, Sanford, Avery, Acco, Smead, Universal, Fellowes, Swingline, Bic, Hammermill, and many more. Save on your next purchase from IBuyOfficeSupply.com with I Buy Office Supply discounts, I buy Office Supply coupons, I Buy Office Supply Promotions and I Buy Office Supply savings found here on 58Coupons.com. 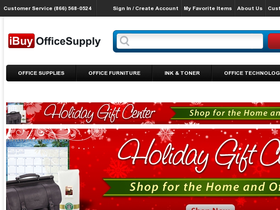 Use this coupon code at I Buy Office Supply to save $20 off your order of $750 or more. Click link to shop. Save $10 on Fellowes Paper Shredders starting at $400 at I Buy Office Supply for a limited time with this coupon code. Click link. IBuyOfficeSupply.com is now offering 5% off all orders of $150 or more Plus Free Shipping. Hurry, this is a limited time offer. Click link to get started. If you're buying over $500 worth of the same product at iBuyOfficeSupply.com you may be eligible for a volume discount. Look into large quantity quotes today. Click link to find out more. Check out IBuyOfficeSupply.com and you can find savings up to 80% on office supplies. Click link to see what's on sale.